The sperm whale's big head is equal to one third of their length in distinctive shape. The species of the sperm whale is macrocephalus which means big head in Greek. The sperm whale's brain is largest and heaviest of all of the mammals, and it's weight almost 7kilograms(15lb). Their skins are very smooth on most part of body but skin on the back is knobby. The sperm whale's last part, fluke, looks like triangle and it is very thick. In the beginning of their diving, we can see their fluke locate above the water. The sperm whales have the blowhole in front of the head and directed to the whale's left. They also have a series of ridges instead of dorsal fin. Their 20-26 pairs of teeth look like cone and each of them is almost 8-20cm long, and one kilogram. We don't know the reason that why sperm whales have teeth, and they don't need teeth for feeding on squid. In the scientific consensus, sperm whale need teeth for aggression. The sperm whales take 16 months in the gestation period. After a birth mother helps calf to swims toward the surface in 10 seconds, it is for newborn's breathing. Normally a female could have 7-10 calves and also have 1%of probability that a female have twins, it is very rare. Both sexes of newborn are about 4m and 1000kg. Males take 18-19years until they grow up completely and females grow earlier than males. The newborn need 40 pounds of mother's milk everyday for 2years. Most sperm whales live 40 years since birth to death. Sperm Whales eat many types of fishes such as giant squid, octopus, and diverse fish, but main food for sperm whale is medium sized squid. A sperm whale needs to eat food about one ton a day. They use their lower jaw which contains 18-25 teeth on each side to feed. Sperm whales are the deepest diving mammals, they can dive into 3km in 90minutes. Before they dive, they bring three tones of blood ton have enough oxygen and also they achieve to dive deeply. When sperm whales diving they face great pressure but they have several adaption to withstand. In Fiji, people attach importance to the teeth of sperm whales because it used as gift between rival chiefs. This gift was called "tabua." Many sperm whale are living in the worlds ocean, and they are hunted for meats, oil, and spermaceti. Their supplies are more useful than other whales. In 1820, 25.9m sperm whale had attacked a Whaling ship, as a result some of sailors died. Sperm whales are not uncommon whales that we can not see normally because they are living underwater. 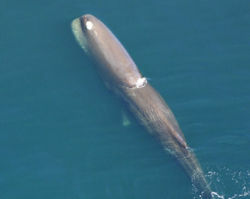 Most sperm whale live in New Zealand's South Island. In New Zealand's South Island, the shelf is not wide so sperm whales can notice shore. In 1970, 8ton, 45foot long sperm whale came to a beach on Oregon, this is the first time that people saw sperm whale. At that time many people surprise about this but sperm whales became a global media spotlight. Sperm whale Multiple Author. wikipedia. ecology of sperm whale Enchatedlearning. This page was last modified on 29 December 2008, at 16:06.